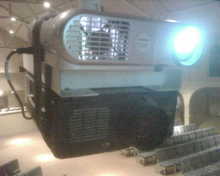 So, last Sunday the lamp on one of our projectors went out during the service. Not gonna lie. i knew it was going out. Should have gotten a replacement for it earlier. But, I didn’t. So we had no back up for this past week. So I ordered one online, 2 day shipping. They were back ordered though. So the next day I ordered another. Different company. Thought it was all good. 2 day shipping again. On Friday, wondering why I didn’t have it yet, I checked the status. It hadn’t shipped yet. At first i was gettin hot, then I looked at the site again. My fault. I missed the spot where this lamp says typically ships in 6-8 days. Shoot! Yep. I gaff taped another projector securely to the hanging one. Wasn’t quite a large enough image for the screen, but better than nothing. Not ideal, not long-term, but it worked! And the new lamp just showed up in my office! So when was the last time you had to get a little creative to solve a problem? We have a term for that here in the south…redneck engineering…but that may not mean much to you Cali guys. 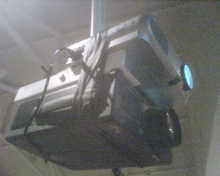 Of course, if you had built an entire projector out of duct tape and toothpcks, then I really would have been impressed. Alex – yup. Ridiculously expensive too. Jeff – Somehow, I don’t doubt that for a second! I don’t solve problems, I create problems. good call Bobby – gotta hate those darn bulbs!